I’m sorry to go all dramatic so soon in the blog post but do you know how there was this guy called Captain Ahab who had sworn revenge on a whale? Sometimes I feel like that when accosted with the word ‘curry’. Seems like an innocuous enough word…and descriptive, so why do I hate it so much? Let me tell you why. It is not descriptive and it is certainly not innocuous. It obfuscates, mystifies and conflates things. And if you think about it, that is exactly the opposite of what language is supposed to do. Why do I hate the word? I hate it because it is a word the British made up from half-heard scraps to vaguely signify the entire cuisine of a sub-continent. It is sometimes used as a generic term, but it promotes the notion that all Indians eat a single dish with a single spice mix in it. I hate it more when Indians use it to communicate with English-speakers. Sorry, people. I hate it. People use this word in different senses. Curry as a Particular Dish: Do you make Curry, people will ask me, or claim to love Curry. I don’t have to spend too much time on this meaning because clearly, Indians don’t all just eat one dish, all billion of us, day in and day out, week after week. Gloopy Spicy Dish: Moving on. Some people use it to mean: any gloopy, reddish brown, spicy dish. Then the question arises: how many spices? If you stick a bay leaf into a beef stew does it become a curry? It is gloopy and reddish-brown. What about gumbo with its filé? Some Indian dishes may be green, non-gloopy, with merely garlic and mustard seeds in it, is that still a curry? I believe that people who use it in this sense are afflicted with Indian-Restaurant-itis. It is the condition of being mainly familiar with Indian food through the means of Indian restaurants. It is not their fault — it is that Indian restaurants outside India (with a few exceptions) insist on putting everything into everything and turning everything into an indistinguishable, reddish-brown mess. That thing — that indistinguishable mess — is a curry. Asian Saucy Dishes: Sometimes the word is used to identify dishes from all over South and South-East Asia that consist of some kind of spicy, saucy thing with floaters in it. Here I must simply plead lack of clarity. That subsumes so much variety as to not be a very useful word. It is as if all baked items from the Western world — including bread, muffins, pies, cakes, croissants — all were called ‘bakies’. A Single Spice: People will often ask me if a certain dish has curry in it. Needless to say, there isn’t a single spice called ‘curry’. 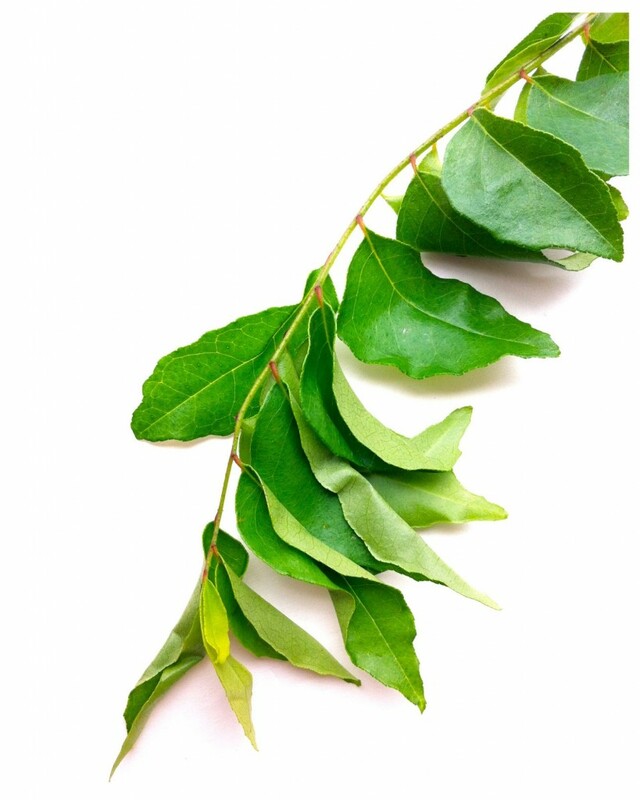 Yes, there is a herb used all over South and Central India called ‘curry leaf’ or more properly, ‘kari leaf’ (Murraya koenigii). Red herring alert! This herb does not make your dish spicy. It adds a sort of herbal or grassy flavor to it. It has nothing to do with the spice mix sold as ‘curry powder’. It is not the main ingredient of it, or even an ingredient. In fact, you can’t use these leaves in their dry form at all, they do nothing. They must be used fresh and thrown into hot oil to get their flavor into food. They add a very subtle flavor, and in my opinion, are better left out than substituted. A Particular Spice Mix: As a spice mix called ‘curry powder’. Far be it from me to deny that such a spice mix exists — you could easily go to any grocery store aisle and prove me wrong. I must only insist that this spice mix is British, not Indian. During the Raj the British brought tea to India and took away a notion of savory dishes made of a mélange of onions, ginger, garlic, coriander, cumin, and turmeric. As this blog post explores, cookbooks from the seventeen hundreds had started to experiment with Indian ways of cooking, say, chicken, using onions, ginger and turmeric. By the eighteen hundreds though, a standardized curry powder had replaced the powdered ingredients. Here is a very early advertisement for Curry Powder: This was being sold to households as ‘exceedingly pleasant and healthful’. Any dish made that used it, apparently became a curry. Needless to say, Indian food does not use a single spice mix; or necessarily a specific mix at all, most of the time, spices are thrown in whole. Some famous dishes (e.g. sambhar; pav bhaji) have gotten attached to their specific combinations; other specific mixes are used for special needs (garam masala; chaat masala). Often times the spice mix is a paste. Most of the time there is no mix at all, but just spices. So what does curry mean — do you see what I mean by obfuscation and lack of clarity? 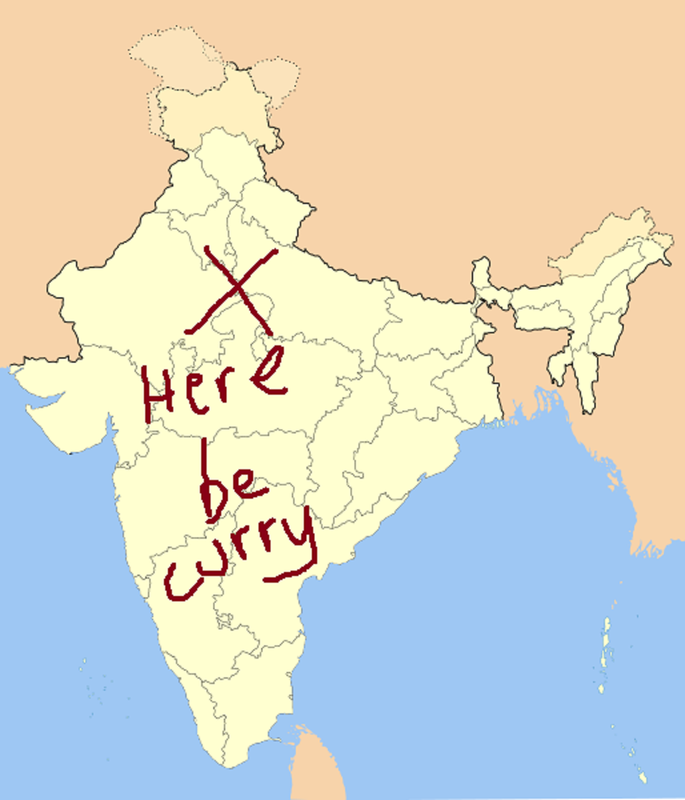 One of the reasons the word ‘curry’ has become such a fixture is that weirdly, there are a number of words all over the subcontinent that vaguely sound like ‘curry’. This makes people nod happily at the word, thinking it is an Anglicization of the one that is most familiar in their language. Most of the words below, by the way, are mostly unrelated to each other, and most have at one time or another claimed to have been the origin of ‘curry’. A. Kadhi: There are the many ‘kadhi‘ preparations in the north which involve roasting chickpea flour and yogurt. This preparation is not highly seasoned, usually, but rather, mild and yogurty. This comes from a Sanskrit word meaning “boiled stuff“. B. Tarkaari: In Nepal or thereabouts, tarkaari is the vegetable side that accompanies the daily meal of rice and lentils. C. Kari: Tamil has a word kari which means black or blackened. Over time this came to mean grilled; then, stir-fried. Tamil uses two types of ‘r’ sounds, this one is the softer one. D. KaRi: This is the second, unrelated Tamil word with the harsher ‘R’ which means ‘meat’. E. Carriel: The Portuguese colonized India before the English did, and by the sixteenth century they were claiming that Indians ate something called Carriel. This is reported by a Dutch traveler named Jan Huyghen van Linschoten, He spent time in Goa and this is how he describes food there: “Most of their fish, is eaten with rice, which they seeth in broth, which they put upon the rice, and is somewhat sour, as if it were sodden in gooseberries, or unripe grapes, but it tasteth well, and is called Carriel, which is their daily meat.” Is this from the Tamil kari meaning blackened or grilled? or from the Tamil kaRi meaning meat? This word, Carriel, is still used in Goa in a sense similar to Curry. There is a pervasive piece of misinformation that first appeared in the Hobson-Jobson Anglo-Indian Dictionary in 1886, and subsequently has been spread throughout the Interwebs by Wikipedia: this is that Curry comes from the Tamil word ‘kari’ meaning sauce. As I listed above, there is no word ‘kari’ that means sauce in Tamil. Since English does not have the other, harsher ‘r’, we do not know which ‘kari’ they meant. On the other hand, perhaps the English were already experimenting with ‘curries’ before they ever came to India…. F. Cury: Way back in the 14th century, a cookbook published by King Richard II’s cooks, which contained 196 recipes, was called ‘The Forme of Cury‘. This was way back before colonization ever happened…this word is from the French root ‘cuire’, the same as ‘cuisine’. Here is an article that delves deeper into the history of the word. And another. And another. So what word to use instead? Ah, language. I tend to use the word ‘gravy‘ for wetter preparations, such as ‘potatoes in tomato-garlic gravy‘. This is the word we used at home. For drier preparations, I might use the word stir-fry or sauté. In general though, most of these dishes use the method of braising, so that word is usually fitting. ‘Stew’ works too. Spicy stew perhaps? Help, I feel another rant coming on. ‘Spicy’ does not mean ‘hot’ as in chili hot. Somebody stop me please. ← A pair of awards…. It has its uses! Though its taste is more suitable to dishes from other cuisines that are attempting an Indian flavor…. I confess I LOVE curry powder in a) Prawn Mayonaisse and b) Devilled Eggs. And Kedgeree, the very plain, flavourless English way. I do have a special place in my heart for Anglo-Indian food. I am not very familiar with it, but remember it from the few hotels that are holdovers from that time that I sometimes visited with my parents. I need to explore this more…. Very cool and informative post! My go-to “Curry” at home is either Rasam ,Sambhar, Pallidya (a version of Kadhi), Gojju (super spicy tamarind, chilli powder, jaggery i.e.,raw brown sugar mix). 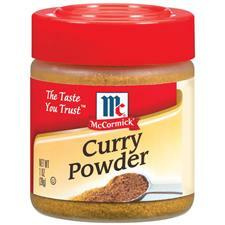 Mom and Mother in Law send me home-made powders for all these dishes…Well, I am on the curry train! Ha Anita pointless trivia maybe :)? I researched this post a lot. I felt like I had to figure out where this word comes from. I’m no wiser now than before. Aneela, I couldn’t agree more. I think curry should be reserved for Anglo Indian or for dishes in English cookbooks and some alternative such as gravy–a world that ironically has itself become almost equally meaningless–should be used for saucy Indian dishes. As I am sure you know, the British in India had a category of gravy curry (as opposed to dry, I assume). Rachel, thanks for your thoughtful comment. It’s the ‘dry’ preparations that I am after. I think they are more authentic. I’ve been thinking about this recently, after I read your article about Persian influences all over…it seems to me that the famous Indian restaurant gravy, heavy and creamy preparations are a Persian influence rather than indigenous (‘Moghlai’…I guess it is right there in the name). Not that authenticity is everything but I just prefer the simpler, drier preparations with whole spices. Aneela, one day we will have a history of the cuisines of the subcontinent that makes sense. I agree about the Persian. And I’m actually not sure that gravy is the best alternative to curry (not that I have a better one) because the techniques of the Moghlai curries are so different.